What has spaceflight ever done for us? A hell of a lot, actually – and aside from trying to get humans to Mars, NASA's technology has trickled down to a host of wearable gadgets. NASA makes a huge investment in technology and each year it releases a report called Spinoff. This details all of the innovations that have been developed as a result of space travel, such as Sony's latest 'magnetic fluid' speakers to more realistic 3D mapping in video games like SSX. Famous US underwear maker Jockey's Staycool range was created using the 'phase change materials' that NASA developed for astronauts' space gloves. The special material is designed to maintain a suitable temperature for optimum comfort. Basically, space pants. NASA's Ames Research Centre originally developed liquid-cooled garments to keep astronauts' airtight spacesuits from becoming hot and humid. The technology has since been used by California-based Vasper Systems to produce compression garments which are designed for more efficient exercise by concentrating lactic acid buildup in the muscles. Sunfriend ($49.99, sunfriend.com) is a direct result of NASA's investigations into measuring extreme ultraviolet radiation on the Solar Dynamics Observatory, where NASA captures all those incredible images of the sun. It's a wrist monitor that lets the user know when they've had enough sun for the day. The gadget sends an alert to prevent sunburn and can be programmed for different skin colour and sensitivity. NASA teamed up with GM to develop this Ironman-style glove that grants the user with enhanced grip power. The idea is that the glove reduces the amount of grip needed by the wearer when holding a tool, reducing the chance of repetitive stress injuries. The glove is designed to be used by both astronauts and workers in the auto assembly industry. 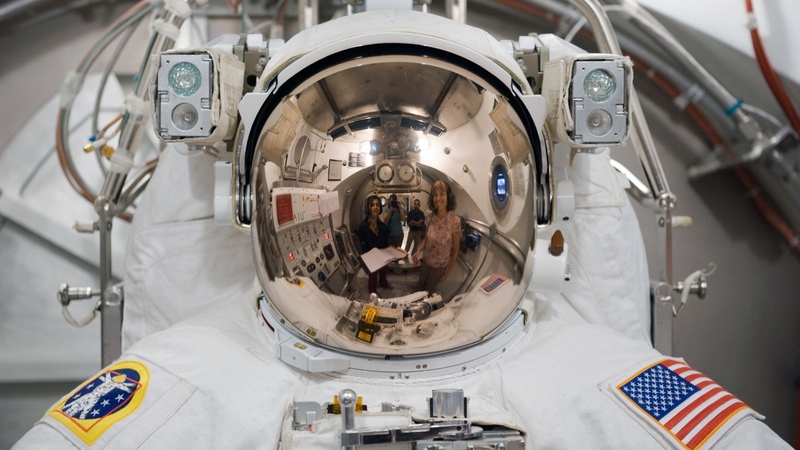 Designed to measure astronauts' metabolic rates, the Portable Unit for Metabolic Analysis was the handy work of NASA's Glenn Research Centre along with Case Western University and Cleveland Clinic. It has since been adapted by Orbital Research for US Navy pilots in order to assess oxygen problems and a device for use in hospitals is currently under development. Johnson Space Center first looked into phase change materials (PCM) for astronaut gloves, in order to keep their hands at a comfy temperature. The clever material is designed to pull moisture from the body, as well as controlling odour and bacterial growth. US clothing company Ministry of Supply, which was founded by several MIT grads in 2012, used the technology in its aptly named Apollo shirt. The company aims to use similarly innovative materials in all its products. Neurofeedback technology was developed by NASA's Langley Research Centre to monitor pilot awareness. It has since been developed for concentration training in several settings including teaching children with ADHD, assisting the recovery of brain injury sufferers and helping athletes to improve their performance. BodyWave picks up brain signals through the body and relays them wirelessly to a computer with dedicated software. Not strictly a wearable, more of a standable, the DBS comprises a sensor-laden standing platform hooked up to a computer. First developed to study the effects of spaceflight on astronauts, the gadgetry was then developed into a product to treat balance disorders. Further modifications resulted in a product used by pro golfers at PGA facilities in order to improve their swing. The tech behind the Zone-Trac was created way back in the 1980s by Optometrist Joseph Trachtman, based on work that Stanford Research Institute did for NASA. It wasn't until 2014 that he released a consumer version of the gadgetry called Zone-Trac. The visor can be used for various aspects of visual training such as improving hand-eye coordination and reaction times.